This introduces children nine to 24 months to singing, dancing, words, parts of the body, movement and more. Ten printable activities provide developmental exercises for your baby to practise while away from the computer. Any movement of the keyboard or mouse brings an instant response of colors, sounds and motions. 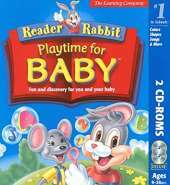 You and your child can interact by moving the mouse or by pressing any key, and an instructional video for parents shows easy ways for you and your baby to use the computer. A game of tag between Reader Rabbit and Mat the Mouse ends with Mat hiding in a toy box. With Mat's help, each of the 10 toys in the box leads your baby into a new experience: singing, manipulating shapes, hide-and-seek, discovering body parts, reading storybooks and (oh joy!) rummaging in drawers. Your baby controls the action by hitting any key on the keyboard (or just hitting the keyboard as they are wont to do) or simply moving the mouse. No clicks required. The cursor is a big fat star that leaves a trail of twinkles and makes a magic-wand noise every time it moves. Brushing it against objects onscreen will elicit anything from a childlike giggle to a "ker-plunk" to the appropriate animal noise.